Hello guyz! We’re going to head through the second part of this tutorial. Here we’re going to learn some amazing tricks about controller & model. Now those who really missed the first part of this tutorial please do read & test the thing first. We’ll discuss something here that’ll also related to the other part. Why only this part every part will be related to other parts. So please do review the older parts before proceeding to the last part. Click Here you can find the other tutorials. When building a fairly complex application it’s always a good idea to plan your code correctly. This is a tutorial that we’re going to learn about how to give a solid foundation while making these kind of complex application. Now we may use two more controller one is a frontend controller & the second one is the admin controller. Why we’re making these two controller is we can use to frontend controller to show up the menu items & everything else in admin controller we may use this one for admin configuration. So to do that go to libraries folder & create two file named “Frontend_Controller.php” & “Admin_Controller.php”. In here we can see that we did anything only dumping some string, but keep it like that we’ll code here after some time in near future. 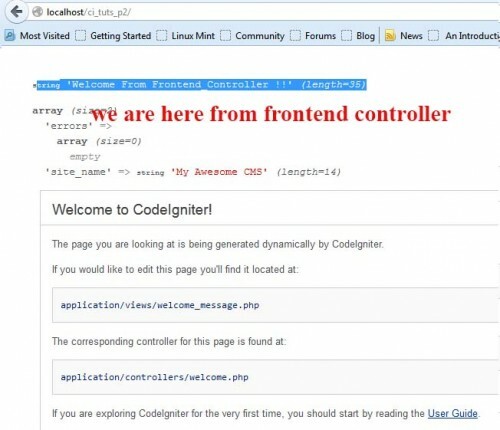 So go to the welcome controller & then extend the welcome class to Frontend_Controller instead of MY_Controller. Let’s see what happens in there. But before reloading your page in the browser go the config file in config folder so that we can autoload the class. For that paste the code below at the beginning of the file. This is the end of the base controller part. Now we are going to use the database means using the Model. So let’s start using model. We’re going to use Migration in here. Those who don’t know anything about migration I’ll tell you to please fist visit the user guide for migration & you’ll get clear idea about migration in there. 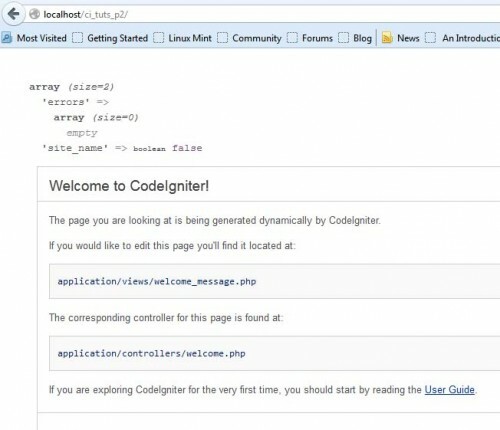 First off all open the migration.php file inside the application->config directory then you should need to edit the code in there. First just change “ $config[‘migration_enabled’] = FALSE;” this part of the code to this “$config[‘migration_enabled’] = TRUE;” & in here “$config[‘migration_version’] = 0;” in the place of 0 you’re going to put the version of migration that you want. For now it’ll be “1“. We’re going to learn the handling of migration in there just in a few minutes. Here we can see that we’ve created a class named ” Migration_Create_users” remember migration classes always needed the name migration at the beginning of it’s name. Now the Up function runs when we do a migration and down function runs when we do a rollback. Then what we’ve done in here we’re passing an array to the “add_field” method to add the field in the table. And in down function we’re using the “drop_table” method to drop the users table. The most interesting part in here is that we’ve set all the things using PHP & that’s the good thing about migration we don’t have to write codes in database from now on. In the upper code just see the comment above the code. I think you guys just understood the running method of migration. Now just go to the browse using this url “ http://localhost/ci//index.php/admin/migration” & see in php myadmin if everythings fine if there’s a table created or not. Look at the picture below to be sure how it looks when the migration works look at the url also. We’ve done so many things creating our base controllers, using migration to set our data model. This is today’s tutorial. We’re gonna be back with more parts of this tutorial so just hangout with us & stay tuned for the next part. Hope you’d liked the article & it’s helpful to you. Please don’t forget to share your thoughts. To download the full source code please hit the download button. I am fairly certain I’ll be informed lots of new stuff right right here! Best of luck for the following! Hi everyone, it’s my first go to see at this web page, and paragraph is actually fruitful in support of me, keep up posting these content. then run this but the display screen have nothing(full white).plz say whats the problem. Thanks for this tutorial but yet I cant set up my database..Please upload the .sql file so that I can create database. I follow all the steps already ..
but why not make a field in a database users? made only field migrations alone ..
waiting for the full and complete series….